Curtis | Castillo PC, formerly The Curtis Law Firm, PC, was founded over 12 years ago by Stephanie D. Curtis. 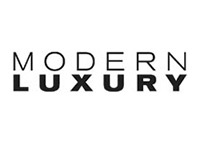 Our mission is to provide innovative solutions for our clients as efficiently and effectively as possible by developing fresh strategies, creating new options, and maximizing value. Our attorneys efficiently coordinate their 50 years of experience to seek the best results on complex issues both in and out of court. Below, you will find links to the Firm’s recent articles, achievements, and client alerts. CCPC celebrates its 18th year as a state of the art restructuring firm and business boutique. Stephanie D. Curtis is honored by Northwood University with a 2015 Distinguished Women Award. Stephanie D. Curtis is selected to serve on the Executive Leadership Team of the American Heart Association for 2016 GO Red for Women Capaign. 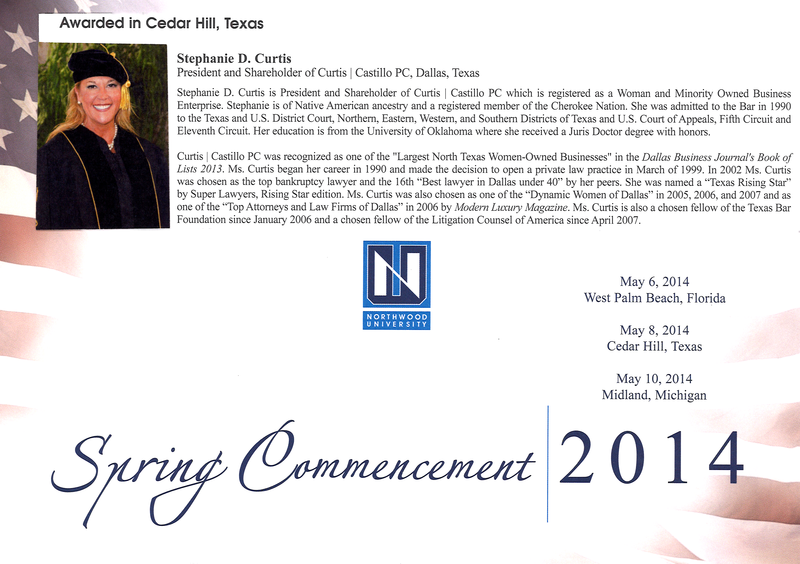 Northwood University bestowed Stephanie D. Curtis with an honorary doctorate degree at it's May 8, 2014 Commencement Ceremony. 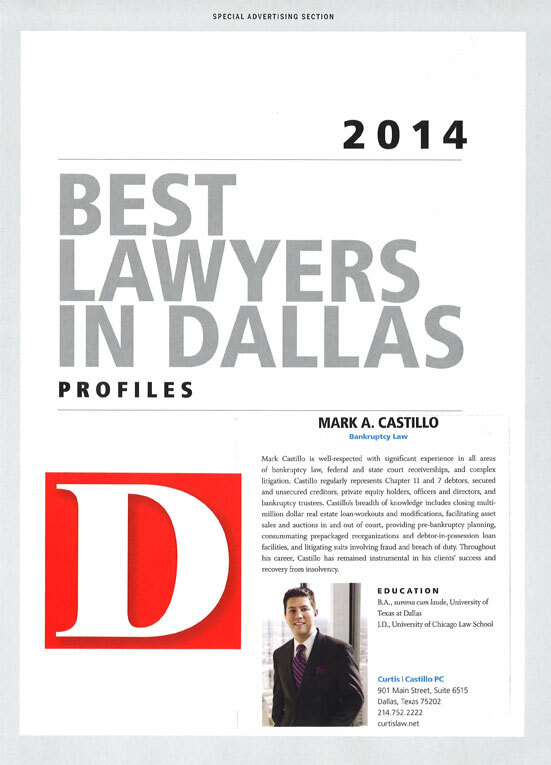 Mark A. Castillo was named as one of the "Best Bankruptcy Lawyers of 2014" by D Magazine in their May 2014 issue. Super Lawyers named Mark A. Castillo and Joshua L. Shepherd as "Texas Rising Stars" in the April 2014 issue of Texas Monthly. Stephanie D. Curtis is named as one of the "Women Leaders in Law 2014" by D CEO in the February 2014 issue. Curtis | Castillo PC was recently awarded collections contract work by the North Texas Tollway Authority, August 2012. Standing Strong, Giving Back: Stephanie Curtis gives back to the Dallas community by giving opening remarks to the 8th grade class at Highland Park Middle School to introduce Christopher Kennedy Lawford and held a private book signing reception to promote Lawford’s newest book, Recover to Live, a treatise on addiction awareness and recovery and how addiction touches so many lives. Curtis | Castillo PC recognized as one of the Largest North Texas Women-Owned Businesses in the Dallas Business Journal’s Book of Lists 2013, December 28, 2012 Edition. Dallas Business Journal Top 100 Largest Women-Owned Businesses in North Texas, featuring Curtis | Castillo PC. 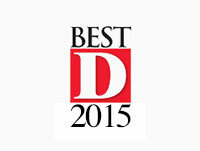 D Magazine article published in “Remembering the Best Lawyers” section, featuring Stephanie Curtis. Dallasnews.com article about Mary Katushabe, an attorney from Rwanda mentored by Stephanie Curtis. Dallas Business Journal article regarding lowered property values, quoting Stephanie Curtis. Henry S. Miller Co. emerges from Ch. 11. Dallas Business Journal article by Stephanie Curtis and Mark Castillo regarding planning ahead for bankruptcy. Mount Pleasant Daily Tribune article regarding Pilgrim's Pride Corporation's pending Chapter 11 Bankruptcy filing. Dallas Business Journal article, regarding the state of the Dallas real estate market, quoting Stephanie Curtis. Dallas Business Journal article regarding Business bankruptcies climbing by 38% over 2006 quoting Stephanie Curtis. Dallas Business Journal's recognition of Northwood University's 40th Annual Founder's Day, Stephanie Curtis, Founder's Day Committee Chairwoman. Dallas Morning News article regarding Wild About Harry's, Inc. Chapter 11 bankruptcy. Dallas Business Journal article regarding Wild About Harry's, Inc. Chapter 11 bankruptcy. Austin Business Journal article regarding Antiqueland U.S.A. Inc., Chapter 11 bankruptcy. Dallas Business Journal article regarding Corporate Magic's suit against 7-Eleven for fraud and breach of contract. 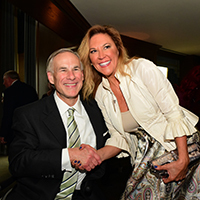 Stephanie Curtis Co-Hosts a reception honoring Faith Johnson with special guest Texas Governor Greg Abbott.